UU’s Danie Shafer (left) and Thibaut Bourrier are finalists for the Mountain East Conference Scholar-Athlete of the Year Award. BRIDGEPORT, W. Va. – The Mountain East Conference announced the 12 female and 12 male finalists for the league’s annual Scholar-Athlete of the Year Award. 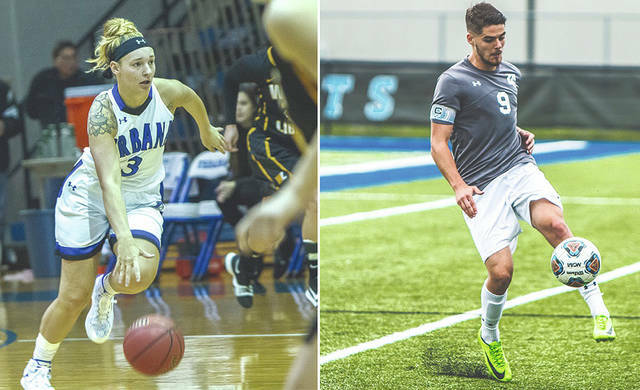 Each institution in the MEC selected one female and one male as finalists for the Scholar-Athlete of the Year Award, which recognizes outstanding academic and athletic performance for the previous academic year. Each finalist will receive a plaque. The criteria to be nominated are: (1) a 3.30 cumulative grade-point average; (2) participated in at least 50 percent of the team’s contests in a MEC-sponsored sport; (3) minimum of one year in residence at the institution. The female finalists are: Sarah Akers (Concord University, Soccer), Mackenzie Harrison (Fairmont State University, Volleyball), Julie Bishop (Glenville State College, Basketball), Norah Barnes (Notre Dame College, Soccer), Morgan Arden (Shepherd University, Basketball), Kristine Gegeshidze (University of Charleston, Tennis), Katie Pritchett (UVa-Wise, Golf), Danie Shafer (Urbana University, Basketball), Caitlin DeVries (West Liberty University, Soccer), Laura Isbey (West Virginia State, Tennis), Kelsie Hibbs (West Virginia Wesleyan, Soccer), Kaitlyn Workman (Wheeling Jesuit, Cross/Country/Track). The male finalists are: Justin Weitzel (Concord University, Cross Country/Track), Lucas Alves (Fairmont State University, Tennis), Jake Hansell (Glenville State College, Track & Field), Austin Treneff (Notre Dame College, Football), Myles Humphrey (Shepherd University, Football), John Cominsky (University of Charleston, Football), Donavan Montague (UVa-Wise, Football), Thibaut Bourrier (Urbana University, Soccer), Dan Monteroso (West Liberty University, Basketball), Matt Kinnick (West Virginia State, Football), Chris Metrick (West Virginia Wesleyan, Baseball), Matt Vogt (Wheeling Jesuit, Soccer). The Scholar-Athlete of the Year is determined by a vote of the administrators in the Mountain East Conference and the league office. The female award winner will be announced in the coming weeks. Additionally, the MEC will also be announcing several of its annual awards over the coming weeks, including Male Sports Coach of the Year, Female Sports Coach of the Year, Male Athlete of the Year and Female Athlete of the Year. https://www.urbanacitizen.com/wp-content/uploads/sites/36/2018/06/web1_uufinalists.jpgUU’s Danie Shafer (left) and Thibaut Bourrier are finalists for the Mountain East Conference Scholar-Athlete of the Year Award.